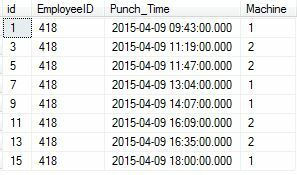 gave error like...Cannot update identity column 'Id' Anyone please suggest how to update Identity column of that table with consecutive numbering starting with 1. Here is the documentation for IDENTITY: https://msdn.microsoft.com/de-de/library/ms186775.aspx. Personally I don't like it to be guaranteed that the generated IDs are in order. A technical ID is supposed to have no meaning other then offering a reference to a record. You can rely on the order, but if order is information you are interested in, you should store that information in my opinion (in form of a timestamp for example). Having said all this; it should never be necessary to change an ID. It is a sign for inappropriate table design, if you feel that need. --before running this make sure Foreign key constraints have been removed that reference the ID. If you really need sequential numbers, may I suggest that you create a table ("OrderNumbers") with valid numbers, and then make you program pick one row from OrderNumbers when you add a row to yourTable. If you everything in one transaction (i.e. with Begin Tran and Commit) then you can get one number for one row with no gabs. You should have either Primary Keys or Unique Keys on both tables on this column to protect against duplicates. Not the answer you're looking for? Browse other questions tagged sql sql-server sql-server-2008 stored-procedures or ask your own question.